“Mr. President, how is the meeting going so far, sir?” the Trump-bashing newsman hollered at as Trump and Kim exited their conference room at the Capella Hotel following a 35-minute meeting. 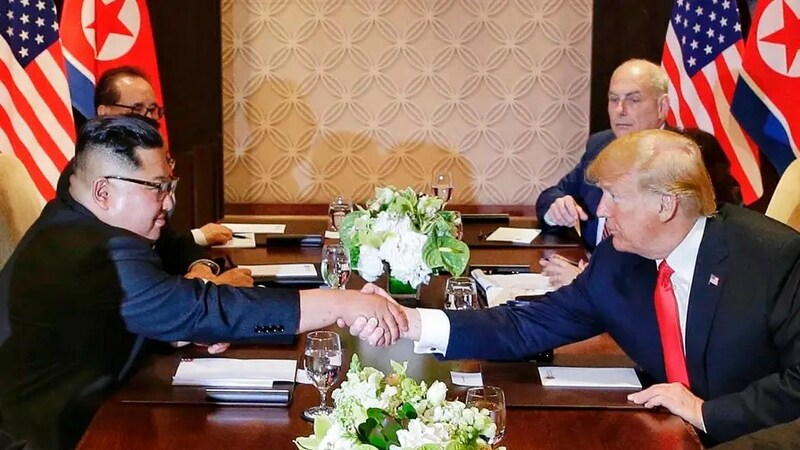 “Any progress, Mr. President?”“Chairman Kim, will you denuclearize?” he pressed. “Mr. President, how’s it going so far, sir? When Trump finally responded by saying it was going “Very, very good,” Acosta seemed encouraged to demand answers from Kim, who is used to a more compliant media.“Will you give up your nuclear weapons, sir?” Acosta shouted, either unaware that Kim had just pledged to do exactly that or thinking that his probing interrogation technique might elicit a more fulsome answer than the recently concluded diplomatic session.Acosta, who regularly tangles with Trump, has built a reputation for casting aside manners and protocol in order to get his often-rhetorical questions on tape for the evening newscasts. Perhaps more than any other reporter, Trump has singled out the cable network’s White House correspondent for scorn and ridicule. Neither Trump nor Kim further responded to Acosta. But on social media, the attacks were swift and snarky.